Product Process: We produce the service drop cable use the high quality aluminum material,Every production process has been strictly checked by our professional technical engineers. 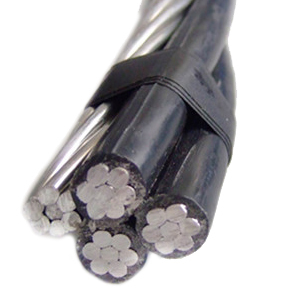 Aluminum quadruplex cable consists of three phase conductors, and one neutral conductor are insulated with PE or XLPE. It is an indispensable basic material to transmit power, manufacture all kinds of motor and instrument, and also achieve the electromagnetic energy conversion. In future, aluminum quadruplex cable is also an necessary products in the electrified and informational society. Huadong Cable Group wants to develop well, and improves the quality of aluminum quadruplex cable and other cables. So Huadong Cable Group adopts scientific theory and method of quality management to manage company. If you want to know the more details of producing process.Please contact us, we will send you the specific information. It refers to many sections, from design, production and after-service. First is the quality management of designed process. The designed process of aluminum quadruplex cable includes: collecting the information, sample design stage, sample making stage, small batch trail stage and mass production stage. About collecting information, huadong does the market survey and market forecast first, and then surveys and analyses the the inside and outside production conditions. It will help us to know comprehensive knowledge about aluminum quadruplex cable. Then we will design the production and then try to produce. When we inspect the trail sample is qualified, we will sample in small production. The final stage is to produce the required aluminum. Through these process, huadong fingers out that good quality is from producing instead of inspecting, so we pay attention the producing process. If you contact us, you will get the detailed video. It is also important. Because of the special feature, the service is difficulty to be judged. Hudong Cable Group considers more about the service. Before selling the aluminum quadruplex cable, the sale manager need to provide you the most professional quote and details, and answer your any question. As for after-sale, we will solve all the quality problems of our aluminum quadruplex cable. We pay more attention to the customer’s experience. If you want to get the high-quality service, leave your message, we will contact you as soon as possible. If you want to experience the perfect service and high-quality, leave your message, we will provide your professional service.